Having an XML sitemap for your site is an integral part of search engine optimization (SEO). By creating and submitting XML sitemaps you are more likely to get better freshness and coverage in search engines. 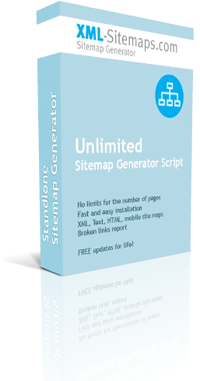 Our Unlimited Sitemap Generator is an easy to install php script which is designed to run on the server that hosts your website. It will work for all sites including dynamic websites such as portals, blogs, forums, and online stores. Support of LARGE websites, dividing the sitemap on the parts per 50,000 URLs each and creates a Sitemap Index file according to the Google sitemap protocol. Any broken links that are detected by the application are reported on a special page, providing you with the URLs pages that refer to these bad links enabling you to fix them and keep the search engine robots on your site. Don't let your website get left behind - Improve your site's visibility in Google and other search engines by creating and submitting XML Sitemaps. "What a wonderful tool! The Standalone Sitemap Generator is a must-have for any serious web professional. I'm not exaggerating when I say that this product will save me several days work in the course of an average month." "I have wasted much time fooling around with xml sitemap generators, either they produce errors or they just did not work. Yours is simple to set-up and use, and makes it easy to find dead links in large sites." Order add-ons for your generator. Please use the link that was sent to your email box right after purchase to download the latest version of generator script.